So finally posting part 2 of my LA trip. And it’s actually not that overdue if you look at some of my other posts. We ended up skipping another few things on our list just to re-visit Little Tokyo on the third day. They have a million ramen places to choose from and we ended up going to Orochon Ramen and Hakata Ramen. We had to wait at both of them but Hakata’s wait was almost 2 hours! They both served great ramen, but the bf and I both agree that Orochon’s soup was better. We like spicy and Orochon gave you the option to make it super spicy. Another thing Little Tokyo was amazing at was mochi. I think the mochi lato at Mikawaya Mochi has forever changed me. No mochi will ever taste as good 😦 They had regular mochi too, but the lato ones were creamier and the skin wasn’t as hard. It was so perfect! From what I’ve seen of the webseries K-town, I had expected Koreatown in LA to be trashier and greasier. It really wasn’t. Instead we found super cheap restaurants! They were quite famous for their Korean BBQ all-you-can-eats and we ended up settling for one that was $11.99 at Sanya Korean BBQ Buffet. So much meat. So worth it. Tell me this isn’t cheap. 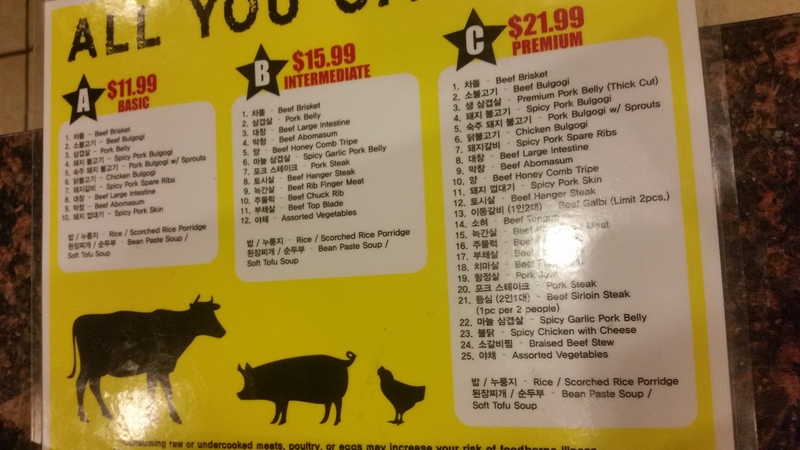 The $11.99 menu was more than enough for dinner. We had lots of beef brisket, thinly sliced. We let it grill just a little longer than necessary, giving the outside a slightly crispier exterior. It was amazing. We also had some pork belly and there were a lot of other things on the menu. But we were quite full from the side dishes they provide you as well. Koreatown also had lots of shops that sold Korean products. I hopped into one or two cosmetic shops just to see what they have and their collections are quite complete. If you’re looking for asian snacks, this also was a good place to go! I was annoyed by LA’s transit system to begin with, but getting to the Getty really was something. We had to take two busses, and the schedules were horrible. It took forever to get to the Getty via transit (about an hour and 20 minutes? ), whereas driving would’ve taken 19 minutes. One thing I did enjoy was seeing the paintings. I’m no art expert, but at the Getty I got to admire the works of some big artists. It was the first time I had seen a Van Gogh, Monet, and a Picasso in real life. Or any famous paintings in real life I guess. 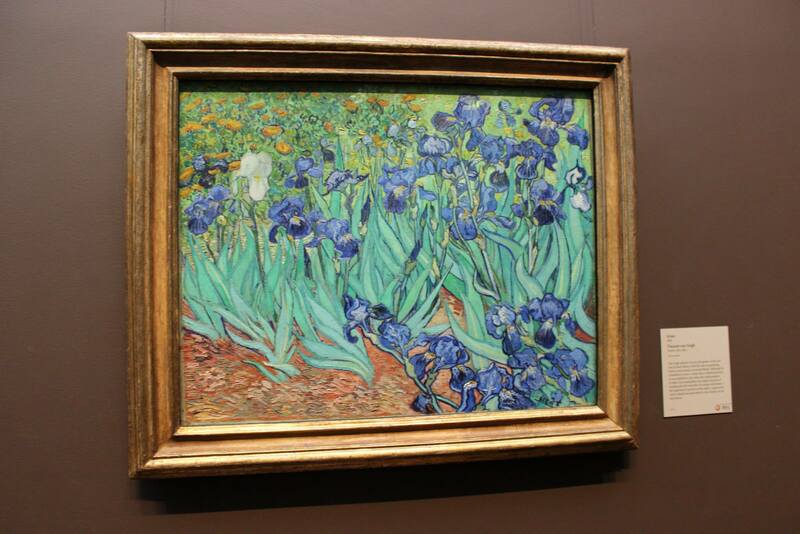 Irises by Van Gogh was the featured exhibit for the period that we were there. A hundred million dollar painting. I didn’t even want to breathe near it. Exiting the metro station for Hollywood, I took a few seconds just to marvel at how alive and amazing Hollywood looked. Bright lights, crowds of people, music everywhere. We hit up a few souvenir shops, went to Madame Tussauds and at night, spent new year’s eve at Hardrock Cafe counting down with other patrons in the restaurant. Madame Tussauds shenanigans. 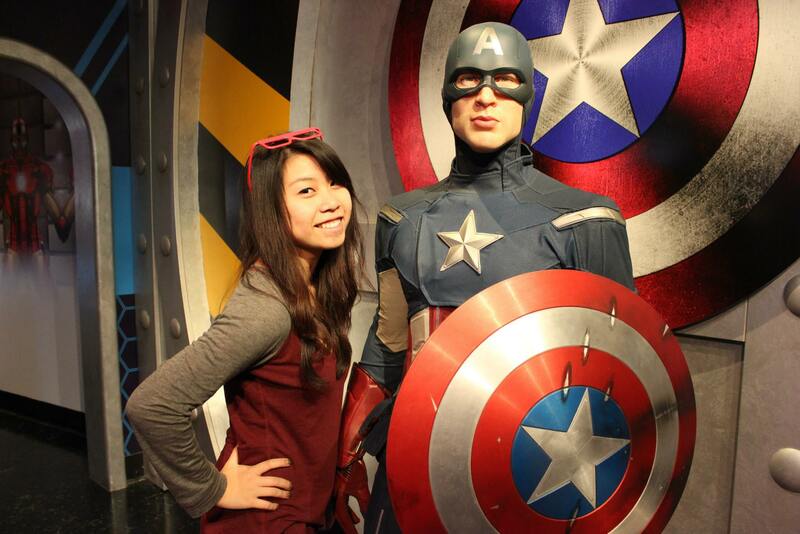 They had a Marvel exhibit! But then we went to explore and walked down Hollywood only to realized that the glam only lasted a few blocks. Beyond the main strip of Hollywood that we always see on TV, the street was lined with mediocre restaurants or shabby looking pubs. The Walk of Fame also deteriorates drastically, the names of actors/actresses being none that we recognize. But I guess to be a tourist attraction, you don’t need to show everyone the full picture before their arrival. My boyfriend and I saved The Hobbit: The Battle of The Five Armies for the TCL Theatre! We saw that they were showing it and decided we’d hold off until we got to Hollywood. Plus, we’d get to check out the TCL Theatre! I could not believe how nice the theatre was and that it is accessible to the public. I’m so used to seeing award shows and events happening there on TV I never thought it would be open for regular movies. They also played movies in IMAX and the quality was so good it was almost disorienting at first watching the characters so clearly. I thought the price was amazing. It was $19 a ticket for IMAX in a gorgeous theatre. In Vancouver, we pay $15 for a shabby theatre seat for IMAX. It was so worth it watching a movie there. If you do go, visit the washrooms. It’s ridiculously big.